Although all kinds of leopards are amongst the smallest of the big cats, they are no less present in the collective conscience for it. Their distinctive ‘rosette’ style spots are a major fashion statement; the lore that surrounds them is widespread and popular; they’re the subject of countless myths, tales, legends, stories, novels, books and films. They’re in heralds and on flags, they’ve been kept in zoos and the vast majority of the human population seems to hold the leopard in healthy respect. Perhaps as a result of this, while they are classified as ‘near threatened’, the plight of the traditional leopard is not as dire as that of some of its numerous subspecies and closely-related brother species. This is also contributed to by the leopard’s stealthy nature – they are remarkably difficult for humans to hunt, track and tackle. This comparative lack of dwindling populations is down mostly to the fact that leopards are the most adaptable of the big cats. “A leopard never changes his spots”, they say, but there are plenty of other things that they can change – they can survive on almost any sort of prey and go without water for extremely long periods, they are expert swimmers and excellent climbers, they adapt to a huge variety of terrains, they know how to hide kills for returning to later, and in general they’re the most versatile of all the feline species. There is little in the feline world that is as instantly recognisable as the leopard’s magnificent coat. These coats vary greatly, though – they can be any colour from pale yellow to a deep, tawny gold, and their rosettes come in all shades of black, grey and dark brown. They’re stealthy, agile and versatile, with large skulls that house powerful jaws and extremely long tails. Their muscles are strong, and it is undeniable that for any prey animal a leopard is the most formidable of enemies. There have been leopards with all-black coats, reddish coats featuring darker reddish rosettes, and stark white coats with markings that are very faint. These variants, however, are rare – and often are not passed onto that leopard’s young, especially as variant leopards of this type seem to birth smaller litters on average. Leopards have the largest distribution of any wild cat. They’re present in almost all of Africa (with the exception of the northern part of the Horn of Africa), large portions of Asia (including India and China), and even some parts of Russia. They are remarkably skilled at stealth, however, and have often eluded local human populations entirely – there have been several cases of humans not discovering for many years that they have been living alongside leopards all along. Their preferred habitats seem to be those of a savannah, but they are remarkably adaptable and versatile. 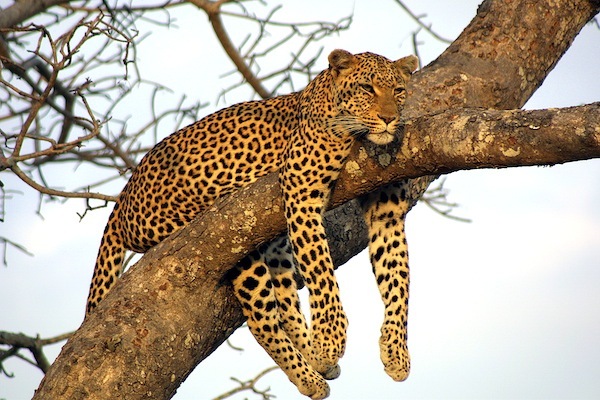 Their habits are altered by their surroundings, however, with leopards living in more open terrain, living nocturnally and those in rainforests or other dense terrains switching to a more diurnal or crepuscular way of life. Leopards are, primarily, creatures of stealth. They aren’t shy or timid, but they do keep to the shadows and the undergrowth – they stalk and slink and stay hidden for as much of their lives as they possibly can. Leopards are amazing climbers. They tend to sleep at the top of trees, if possible; they also seem to enjoy eating from the boughs of trees, and they can descend tree trunks headfirst in only a few swift, graceful movements. They also are capable swimmers – and they seem to enjoy swimming, too, often being seen to enter the water when not hunting, washing or drinking simply to paddle around for a while before returning to shore. Leopards are highly vocal cats – they can meow, growl, roar and grunt, and they make an unusual ‘sawing’ sound that is thought to be related to alerting other nearby leopards – such as their own cubs – to danger. Their home ranges vary wildly, and those of males never seem to overlap – though those of females do, and some female ranges appear to be entirely enclosed within territory claimed by a male. Leopards eat everything. They’ll eat insects and beetles, and they’ll successfully take down and feast upon an antelope weighing 2,000lbs. They can kill crocodiles, gorillas, jackals and vultures – but they’re just as happy surviving on the flesh of reptiles, amphibians and small goats. They eat their prey under cover of scrub or at the top of trees, and they know how to safely hide and store prey to prevent other opportunistic hunters from tracking down and stealing their meat. The myth of the ‘man-eating leopard’ is not entirely without basis, either. While humans make poor game for cats – we’re fast and well-tooled, and by far one of the most dangerous predators in the world – a leopard who is malnourished, trapped or otherwise desperate may very well hunt, stalk, kill and eat a human being. More than that, once they’ve done this once they sometimes acquire a taste or a habit for it – meaning that in one particular case, a leopard in India killed and ate more than four hundred people before finally being taken down by legendary big cat hunter Jim Corbett – whose previous kills included another man-eating leopard, that one thought to have consumed something in the region of a hundred and twenty-five people before he succeeded in his hunt. 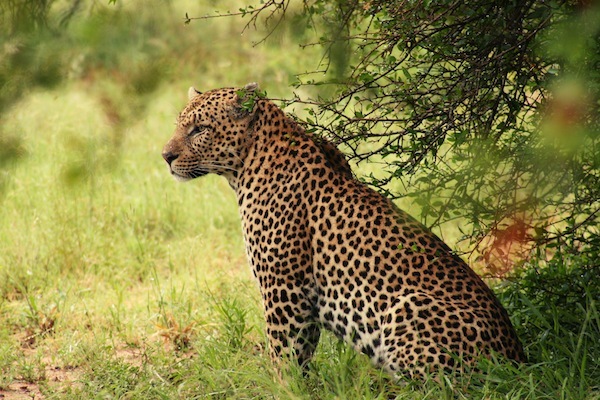 Depending on their region, leopards may sometimes breed and mate all year round. Their gestation periods last for a little over a hundred days and litters usually contain three or four cubs, but not all of these cubs will survive – mortality is thought to a something in the region of 40-50% during the cat’s first year of life. Birthing usually takes place in caves or crevices; the mother seeks out somewhere well-concealed and hard for less limber animals to reach. Leopard kittens tend to stay with their mother for up to the first two years of their lives – in part because they are so helpless and prone to accidents and death before they’ve reached relative maturity.